Conveyor Solutions, Inc. has a variety of motorized belts and gravity conveyors available for rent. Rental machinery is a great option to increase capacity temporarily for an important job or expand your facility during peak season. Talk to one of our knowledgeable team members to find out if rental equipment from Conveyor Solutions is the right option for your business. Interested in requesting a quote or have a question? Motorized belts give you the freedom to move stock quickly and efficiently. Looking to rent equipment? Conveyor Solutions has you covered. Give us a call at one of our nation-wide locations or stop by our headquarters in Schaumburg, IL today. Conveyor Solutions Inc. has gravity conveyors available for short- and long-term rentals. Whether you're not ready to commit to a purchase or don't need to, Conveyor Solutions can help you find the rental equipment you need. To keep your projects organized, well planned and expertly executed, rely on our Project Management teams. 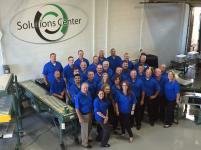 Based in Schaumburg, IL, Conveyor Solutions, Inc. provides materials handling solutions throughout the nation.